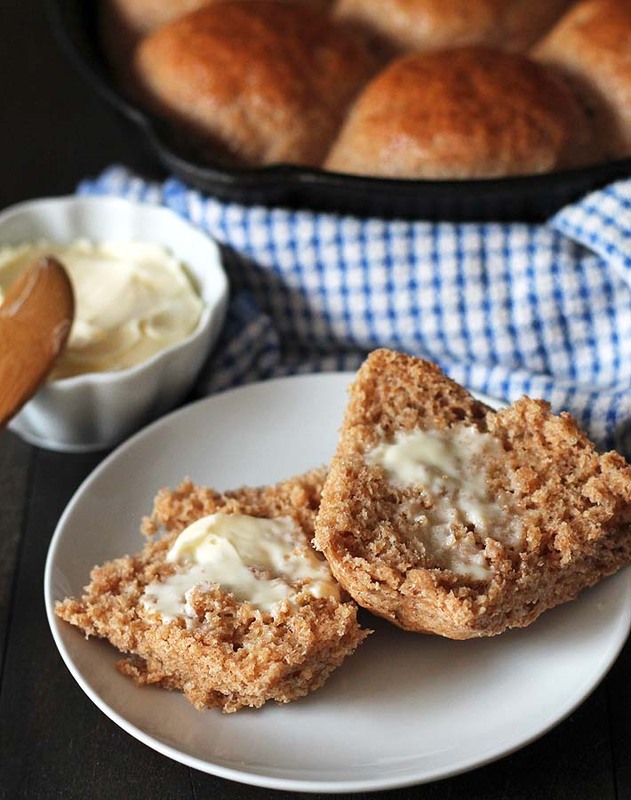 Fluffy vegan spelt rolls that are hearty, slightly sweet, and delicious. A perfect replacement regular rolls, these spelt buns will become a new favourite! 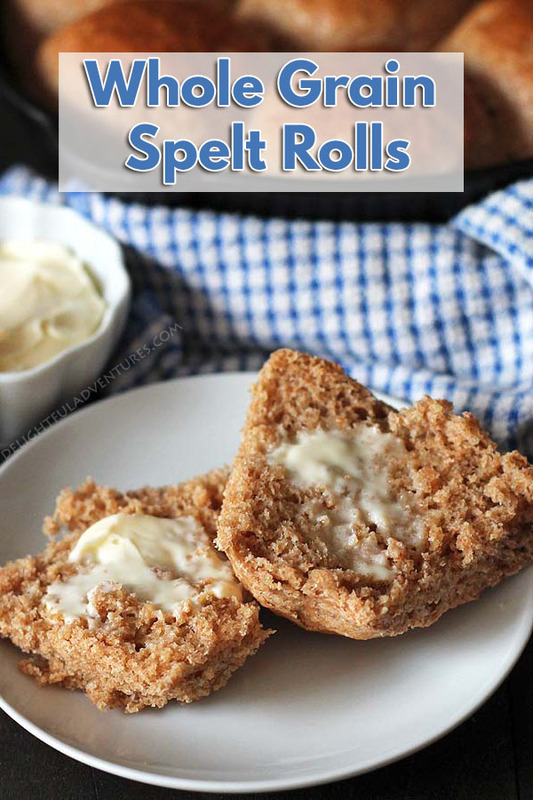 If you’ve never tried spelt rolls, you’re in for a treat with this recipe. Baking with spelt flour is a little different than baking with other flours. Each one has its own quirks, but spelt is one that I rarely work with, so there was a little learning curve to get to these gorgeous, fluffy, whole grain vegan spelt rolls. First off, spelt flour is not gluten free. It’s a type of wheat but does contain a little less gluten than wheat flour. If you’re interested, you can read more about that here. There are also different types of spelt flour. 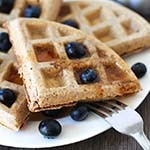 For this recipe, be sure that you buy “whole” spelt flour and not white spelt flour. I haven’t tested with anything other than whole spelt flour. I do think other specific types of flours will work as a substitute for the whole spelt, but since I haven’t personally tested it yet, I don’t want to say for certain that they will work. Once I test, I will update! 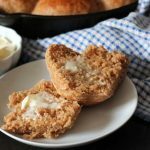 To come up with this recipe, I went back to my vegan hot cross buns recipe, stripped it of all its sweetness, spices, and add-ins and ended up with a bare bones roll recipe to experiment with. How is baking with spelt flour different from baking with wheat flour? When it comes to using spelt flour in baked goods, there are a few things you need to take into account to make sure your recipe will work. First, spelt flour absorbs less liquid than wheat flour, so I had to cut back on the liquids in the original recipe to make this one work. On my first try, I left them to rise for the same amount of time as I did with my wheat flour hot cross buns and they turned out well, texture-wise, but taste-wise? Nope. They tasted very “yeasty” which is something that will happen if you leave your dough to rise for too long. Back to the drawing board. The second time around, I cut back on the first rise by 15 minutes and that did the trick. The resulting spelt buns were amazing! As mentioned above, if you’ve never tasted spelt buns, you need to treat yourself and make a batch for yourself. 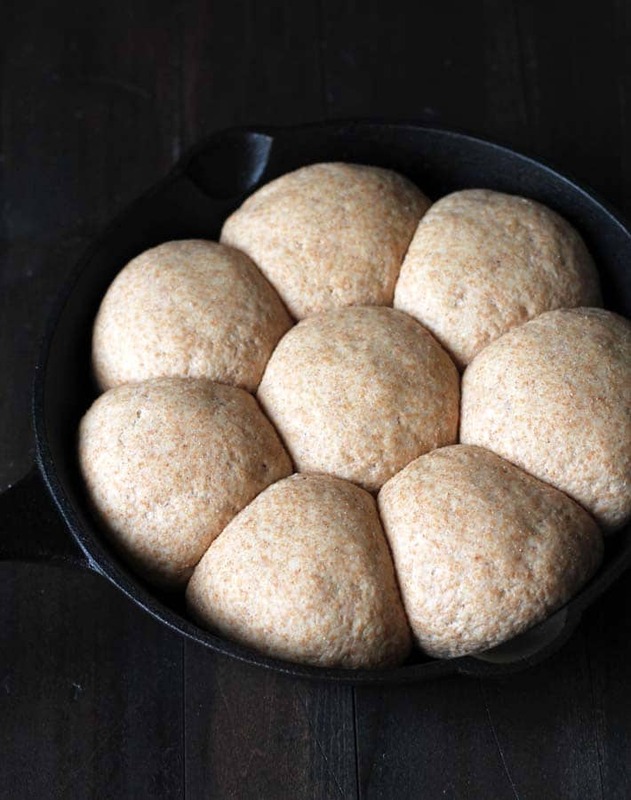 Whole grain spelt flour will give you fluffy spelt rolls that are hearty, dense, filling, and nutty flavoured (These aren’t the airy white dinner rolls you may be used to!). There’s also a touch of sweetness, which is nice. I like to brush the tops with a little oil for presentation (and they look nice in the photos, don’t they? ), but that’s totally up to you and your preferences. 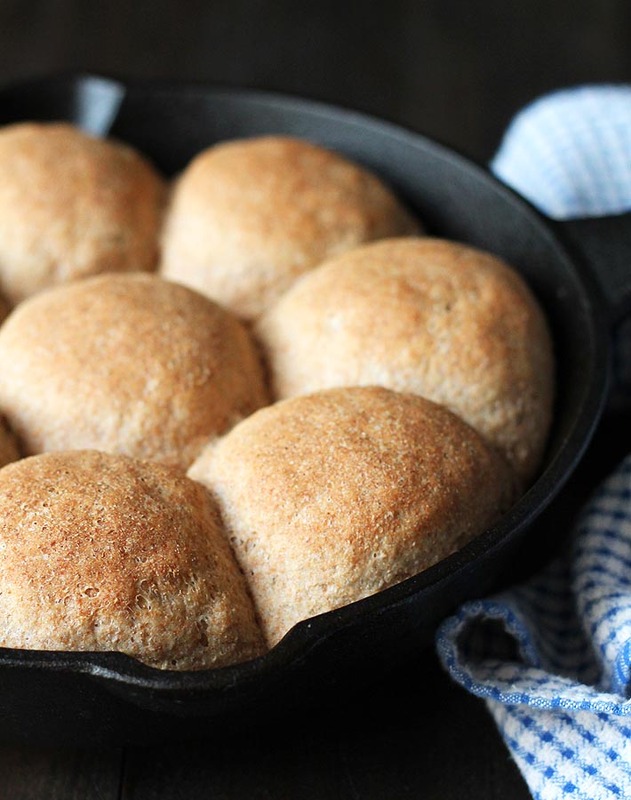 You can enjoy your spelt rolls any way you like! 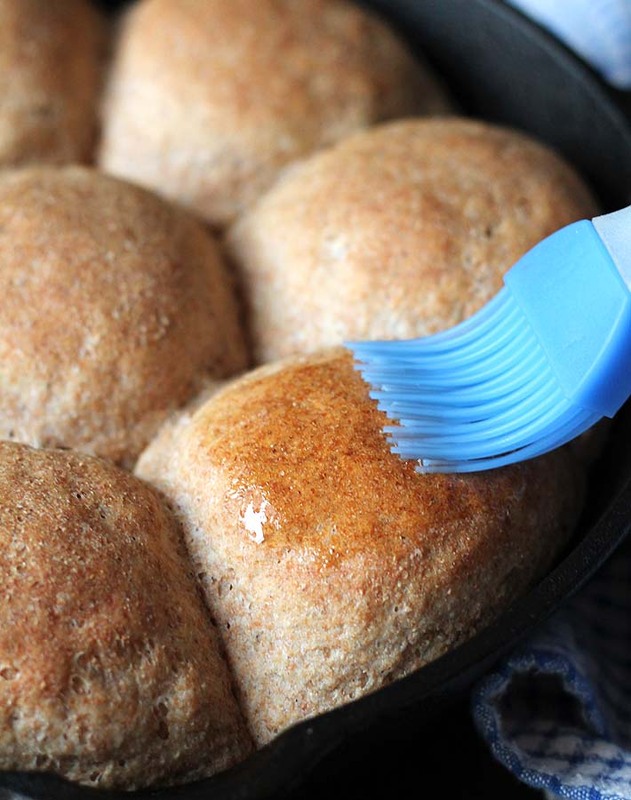 They’re perfect to have as dinner rolls, or you can use them for sandwiches. Or you can just have them as a snack with whatever spread you like. They’re great with this easy strawberry chia seed refrigerator jam, and of course, they go perfectly with vegan butter or margarine. 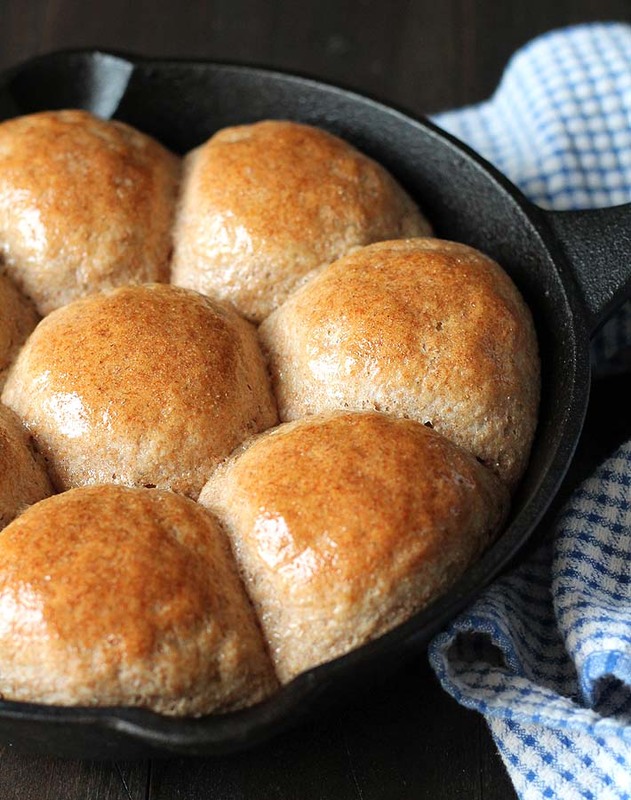 Fluffy vegan spelt rolls that are hearty, slightly sweet, and delicious. A perfect replacement regular rolls, these nutty spelt buns will become a new favourite! When the yeast has foamed up, add the room temperature/lukewarm milk, oil, sugar, salt, and 2 cups of whole spelt flour. Mix with a spoon to combine. Mixture will look like a batter. Put stand mixer bowl in place, add 1 more cup of flour and using the dough hook, set the mixer to knead. After the mixture has formed a dough, you will know it is good when it does not stick to the sides. If it is still too sticky, add flour, a little at a time. Let mixer knead dough for about 3 minutes and until it is no longer sticky. Lightly oil the inside of a medium-sized bowl. Remove dough from mixer bowl and place into the oiled bowl. 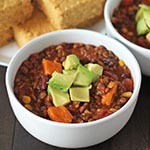 Cover the bowl with a towel and let it sit in a warm spot until it has doubled in size, about 45 minutes. After the 45 minutes have passed, punch the dough down and knead for a few seconds to get rid of any air pockets. Separate the dough into 8 equal sized pieces. Roll each piece into a ball and place each into the pan or baking dish. It's OK if they are close together. Cover with a towel and place in a warm spot. Let rise for 30 minutes. Preheat oven to 375°F. Bake for 18 minutes or until they are golden brown. Remove from oven and let cool in the cast iron pan. If you have used a cake pan or a baking dish, let cool for a few minutes and then remove rolls and place on a cooling rack. When putting the dough to rest and rise, I like to put it into my oven with the light on. This created a warm environment for the dough to do its thing. Store any uneaten rolls in an airtight container. 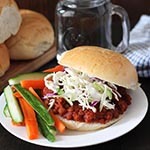 Rolls will keep for about 2-3 days before going stale. I have not made this recipe with any other flour other than whole grain spelt, so if you make it with any flour other than the one I use, your results may not be the same as mine. I made these and they were very good. I made them a little bigger to use as sandwich rolls. They make a nice change from regular sandwich bread. Will make again.